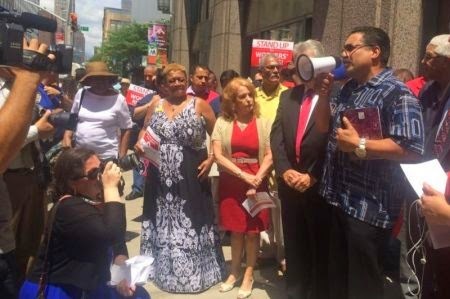 NEW YORK, Nov. 25 – A Regional Director of the National Labor Relations Board has found merit in a sweeping charge the Newspaper Guild of New York filed in June against ImpreMedia, the parent of El Diario La Prensa, after the company fired several veteran employees. The charge included a claim that four Guild-represented employees were fired for union activity. The firings of veteran journalists were part of a series of union-busting activities that have jeopardized the future of El Diario La Prensa, the nation’s largest and oldest Spanish-language daily paper. The NLRB told the Guild and the company that it has authorized a complaint, similar to an indictment, on nearly all parts of the charge. It affirms the Guild’s claim that the company engaged in illegal union-busting activities, including hiring non-union employees to take the place of unlawfully fired Guild members and ignoring the Guild contract. Impremedia has until mid-December to reach a settlement with the Guild. If there is no settlement, the NLRB will seek an administrative trial date in early 2015 to pursue the charges.  ImpreMedia illegally discharged Guild-represented employees, including veteran journalists. Four of those fired were targeted for union activity.  ImpreMedia violated the union contract concerning layoff procedure and payment of severance.  ImpreMedia unilaterally altered the Guild’s jurisdiction and refused new union representation. In light of these charges, the Regional Director is also considering whether ImpreMedia defaulted on an earlier settlement in which the company committed not to threaten employees with discharge for supporting the union. “The NLRB’s findings are a significant victory for the employees who were illegally fired for their involvement with the Guild. It is also a clear indication that the paper is trying to undermine high-quality journalism. We will work to reach a settlement and seek an immediate reinstatement of the journalists,” said Guild President Bill O’Meara. “We are proud of this victory for Spanish-speaking New Yorkers who value quality journalism and rely on El Diario to shed light on the issues facing our communities. We hope ImpreMedia will reach a settlement with the Guild and we will continue to fight until our colleagues have been reinstated,” said Oscar Hernandez, the Guild’s El Diario Unit Chair. On June 13, ImpreMedia illegally fired seven Guild-represented El Diario employees. The firings, which violated the paper’s contract with the Guild, were just one of a series of steps the company took to replace veteran journalists with decades of experience serving the Hispanic communities of New York. At the same time, the company hired several nonunion journalists to replace those who were let go, and threatened current employees who speak up. The Guild also asked the NLRB to seek a court order to restore the fired workers while the dispute is being litigated. The NLRB said that request is under consideration. El Diario reporters and the Guild are fighting to save the jobs of their fired colleagues and to preserve high-quality journalism at El Diario. The Newspaper Guild of New York, Local 31003 of the Communications Workers of America, represents 2800 journalists and other employees at New York area-based news organizations and other companies, including The New York Times, Thomson Reuters and Time Inc.